Two complete clods, nattering about all of the games they play way too much of. Welcome to the 24th August episode of our short form weekly news bulletins. Approximately 10 to 15 minutes to round up the weekly games news that you might have missed. This week Christi dishes up LOTS of Gamescon news, and it's been a big week for news. Along with a game suggestion to help you chill this weekend. 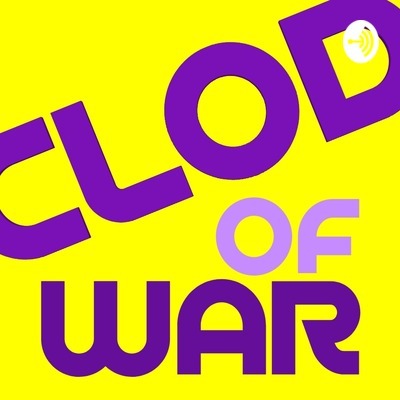 Give it a whirl and let us know what you think @clodofwar on twitter, or via voice message on the anchor app! As promised here's my new mastodon account if you're where all the cool folk are: @Pixelchristi@elekk.xyz Our brilliant Newsclod theme tune is courtesy of Erik Matyas at soundimage.org Bleeps and bloops courtesy of audiosoundclips.com Thank you all for making your work available on creative commons. Podcasts like this wouldn't exist without you. Whether that's a good thing... I'll leave to others to decide. This is a special (and slightly testing the waters) episode of our NewsClod bonus series. Day 1 of Gamescom 2018 has just passed and Christi's going to try and take you through the best of the day's events. And believe us when we say he took a hit for you when he watched the Inside Xbox episode so that you really don't have to. Give it a whirl and let us know what you think @clodofwar on twitter, or via voice message on the anchor app! Our brilliant Newsclod theme tune is courtesy of Erik Matyas at soundimage.org Bleeps and bloops courtesy of audiosoundclips.com Thank you all for making your work available on creative commons. Podcasts like this wouldn't exist without you. Whether that's a good thing... I'll leave to others to decide. This might be carried on through this week as there was so much news today that a normal NewsClod Friday episode couldn't really cover it. We'll see how it goes. Be aware that this is a little more rough and ready than normal. Welcome to the 17th August episode of our short form weekly news bulletins. Approximately 10 to 15 minutes to round up the weekly games news that you might have missed. This week Christi Serves up LOTS of Quakecon news, a couple of exciting Switch developments, to name just a few things. It's been a big week for news. Along with some gaming suggestions to accompany the weekend beers. Give it a whirl and let us know what you think @clodofwar on twitter, or via voice message on the anchor app! Our brilliant Newsclod theme tune is courtesy of Erik Matyas at soundimage.org Bleeps and bloops courtesy of audiosoundclips.com Thank you all for making your work available on creative commons. Podcasts like this wouldn't exist without you. Whether that's a good thing... I'll leave to others to decide. Welcome to the 10th August episode of our short form weekly news bulletins. Approximately 10 to 15 minutes to round up the weekly games news that you might have missed. This week Christi buttles you news about Nintendo Online, Diablo, Amazon UK being b*****s and more. I promised to link my video on Dead Cells so here it is: https://www.youtube.com/watch?v=Jk-HBQkYblA Give it a whirl and let us know what you think @clodofwar on twitter, or via voice message on the anchor app! Our brilliant Newsclod theme tune is courtesy of Erik Matyas at soundimage.org Bleeps and bloops courtesy of audiosoundclips.com Thank you all for making your work available on creative commons. Podcasts like this wouldn't exist without you. Whether that's a good thing... I'll leave to others to decide. Welcome to the 27th July episode of our short form weekly news bulletins. Approximately 10 to 15 minutes to round up the weekly games news that you might have missed. This week Christi returns as NewsClodder after a week away on holiday. We cover Octopath Traveller, Sony resignations, ZX Spectrum related disasters and more. Give it a whirl and let us know what you think @clodofwar on twitter, or via voice message on the anchor app! Our brilliant Newsclod theme tune is courtesy of Erik Matyas at soundimage.org Bleeps and bloops courtesy of audiosoundclips.com Thank you all for making your work available on creative commons. Podcasts like this wouldn't exist without you. Whether that's a good thing... I'll leave to others to decide. Welcome to the 27th July episode of our short form weekly news bulletins. 10 to 15 minutes to round up the weekly games news that you might have missed. This week Ian stands in for Christi, like a boss. Give it a whirl and let us know what you think @clodofwar on twitter, or via voice message on the anchor app! Our brilliant Newsclod theme tune is courtesy of Erik Matyas at soundimage.org Bleeps and bloops courtesy of audiosoundclips.com Thank you all for making your work available on creative commons. Podcasts like this wouldn't exist without you. Whether that's a good thing... I'll leave to others to decide. Welcome to the third episode of our short form weekly news bulletins. 10 to 15 minutes to round up the weekly games news that you might have missed along with the odd suggestion for what might be worth playing this weekend. Give it a whirl and let us know what you think @clodofwar on twitter, or via voice message on the anchor app! I promised I'd link it so here it is. The Eurogamer article on Crackdown 3: https://www.eurogamer.net/articles/2018-07-04-four-years-after-it-was-announced-crackdown-3-is-in-a-tough-spot Our brilliant Newsclod theme tune is courtesy of Erik Matyas at soundimage.org Bleeps and bloops courtesy of audiosoundclips.com Thank you all for making your work available on creative commons. Podcasts like this wouldn't exist without you. Whether that's a good thing... I'll leave to others to decide. Welcome to the second episode of our short form weekly news bulletins. 10 to 15 minutes to round up the weekly games news that you might have missed along with the odd suggestion for what might be worth playing this weekend. Give it a whirl and let us know what you think @clodofwar on twitter, or via voice message on the anchor app! Our brilliant Newsclod theme tune is courtesy of Erik Matyas at soundimage.org Bleeps courtesy of audiosoundclips.com Other effects courtesy of jovanovich and Iamgiorgio at freesound.org Thank you all for making your work available on creative commons. Podcasts like this wouldn't exist without you. Whether that's a good thing... I'll leave to others to decide. Spelunk your way to the bottom of the niche gaming crevasse, bathe in the crystal shimmer of the forgotten gems, lose yourself to the murk of obscurity, and be rescued by the calm uplifting arms of mainstream gaming. Join Ian on his journey from frustrating fanaticism to charmed contentment. 3: July 1st - Where do we go from here?